Sega Sammy Holdings (セガサミーホールディングス株式会社) is the parent company of Sega. It was formed in 2004 after a merger between Sega and Sammy Corporation. It is the holder of various companies originally owned by Sega or Sammy and has interests in many others. Under the Sega Sammy regime, Sega and Sammy still operate independantly, though Sammy dropped its video game operations to concentrate on its successful Pachinko operations in Japan, and Sega took over Sammy's smaller video game division. Sega is the bigger and most well known of the two main companies involved, however was forced to look into the option of merging due to various unsuccessful endeavours (mostly the Sega Dreamcast) put them in financial troubles. The Pachinko and Pachislot markets are the holding company's biggest source of revenue, accounting for 54% of sales in 2011. 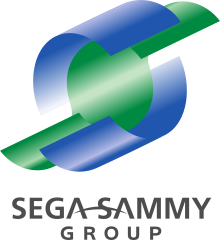 According to its website, Sega's blue colour scheme stands for "success and growth" while the green of Sammy stands for "stability and permanence".